Pat the ribeye dry with paper towels to remove the excess moisture. This also helps to tenderize the meat. 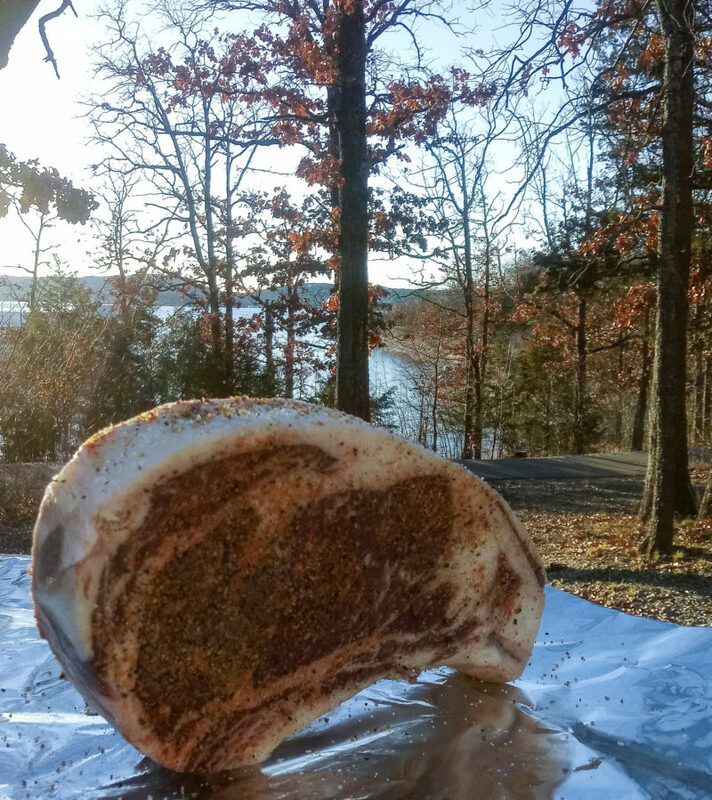 Heavily season both sides of the ribeye with sea salt and the garlic pepper seasoning. 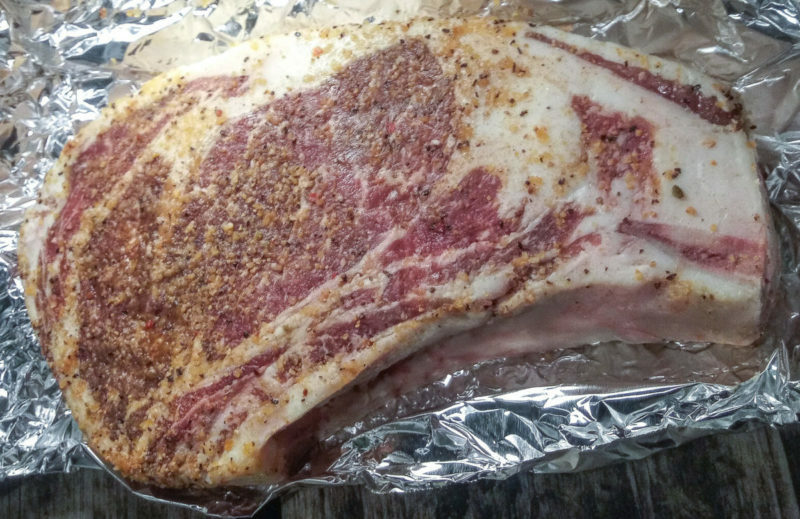 Some of the seasoning will fall off during processing and cooking which is why seasoning the ribeye on the heavier side is a good idea. Wrap the ribeye steaks in aluminum foil and put them back in the cooler or refrigerator to rest for another 24 to 48 hours. When you are ready to cook them, remove the ribeye steaks from the foil pouch. Set the meat aside someplace safe where animals will not be able to access it to allow the meat to relax until it is soft to the touch. This helps when you are cooking it over an open fire. Season the meat again if you wish too. While the meat is resting, make sure the campfire is going good. Use a wood such as oak, apple or cherry to add flavor to the meat. Once the fire is hot place a BBQ grill grate over the top of the fire. Be sure the grate is balanced. You can use rocks, concrete blocks, green wood or anything that won’t easily catch on fire to balance the grate. If you are using green wood, leave the bark on and when they do start to catch on fire, replace them before they burn up and your grate falls. It is also a good idea to keep the meat away from the wood stakes so grease does not accidentally drip on them! Give the grate time to get nice and hot from the fire before putting the steaks on the grate. Sear both sides of the ribeye steak for one minute directly on the open campfire grill to give a nice char and grill marks. By this time the campfire should have died down some, if not, pull the steaks and wait until it does. Once the campfire had died down and there are no more large flames, place the steaks back on the grill with the bone side of the steaks closest to the fire and let the steaks cook to your desired liking. Be sure to turn them every fifteen minutes or so to prevent them from sticking and also to make sure they cook evenly. 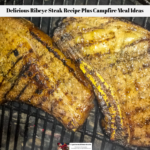 A well done piece of meat can take anywhere from 15 minutes to 20 minutes depending on how hot the fire is and how far away the grill grate is from the actual fire. Using a meat thermometer is always a good idea to be certain that your meat is the doneness that you like, however do not poke a ton of holes in your meat to test the temperature because this does allow the juices to leak out. Remove the ribeye steaks from the grill once they are about 5 degrees Fahrenheit from their desired doneness. Sit them on a plate and allow them to rest for another five minutes. The temperature inside the piece of meat will continue to rise.